On behalf of the Board of Directors and the Executive Director we are thankful to everyone who voted for Participation House Markham in the Christmas charity drive sponsored by North York Chrysler. The results are in and Participation House, Markham came in 4th in the voting ranking. 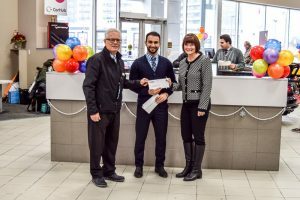 A cheque in the amount of $ 3,500 was presented to the Executive Director, Shelley Brillinger and Board Fundraising Chair, Garry Lander at the North York Chrysler dealership. We are very grateful for the corporate donation support which will be directed to the 2018 Build a Van Campaign.